The early 60’s saw the Junior League concentrating on two areas: the arts and children. In 1960, the El Paso Museum of Art opened with a Children’s Art Center as part of the new facility, funded primarily by the League. Coldwell School children attending the Young People’s Symphony Concert & then going backstage to show Maestro Orlando Barera their intermission songs. Pictured are Lydia Paul, Anne Lorentzen, Maestro Orlando Barera, Dwight Deter, and Jimmy Dixon. In 1962, the League funded the Family Service Program, providing salaries for caseworkers involved in remedial and preventive work. 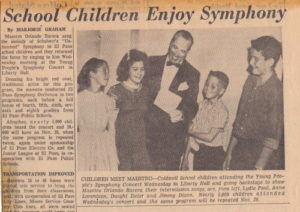 Throughout the 1960’s, the popular Young People’s Symphony continued. By 1969, more than 18,000 children a year were exposed to symphonic music-for a mere 20 cents each. In 1968, more than 20,000 public school children were entertained by “Kalau and the Magic Numbers,”cast entirely by League members. The needs of the family were expanded to include senior citizens in 1967, when a recreational program for the aged was initiated at the Sun Plaza Housing Project. In 1965, League members voted to donate over $20,000 to purchase a Spitz Planetarium for the use of children in public schools. 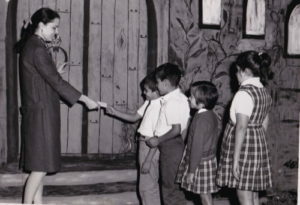 Mrs. Gordon Frost, Chairman of JLEP’s Haunted House Committee, collects ticket from local school children eager to see the Haunted House located at the Bassett Center Mall. Interest in improving the quality of education within our public schools was the catalyst for developing one of the most effective projects in the League’s history: Volunteers in Public Schools (VIPS), which began in 1969, with a pledge of $20,000 and a large volunteer base. During the late 1960’s, the League began to make some directional changes that paralleled the rest of society. The League began to explore solutions to the problems of juvenile delinquency and drug abuse, air pollution and its effect on the environment, public television, and the problems of young probationers. The League raised the necessary funds through the “Follies Revue” (netting $20,000 in 1963), the Charity Ball, the Haunted House (netting $6,109.39 in 1969-1970), and exhibition sport matches. The League headquarters was completed in July, 1962. After working for over 30 years out of basements, attics, garages, and even fire stations, JLEP finally had a place to call home. Land for the building was donated by the Coronado Development Corporation. Funds for the building were raised from volunteer pledges of League members, and it was voted to loan or give voluntarily $100 each to the building fund over a three year period. In 1967 to 1968, the minimum age requirement for admission was raised to 21. In 1968, dues for Active members were raised to $45.00.